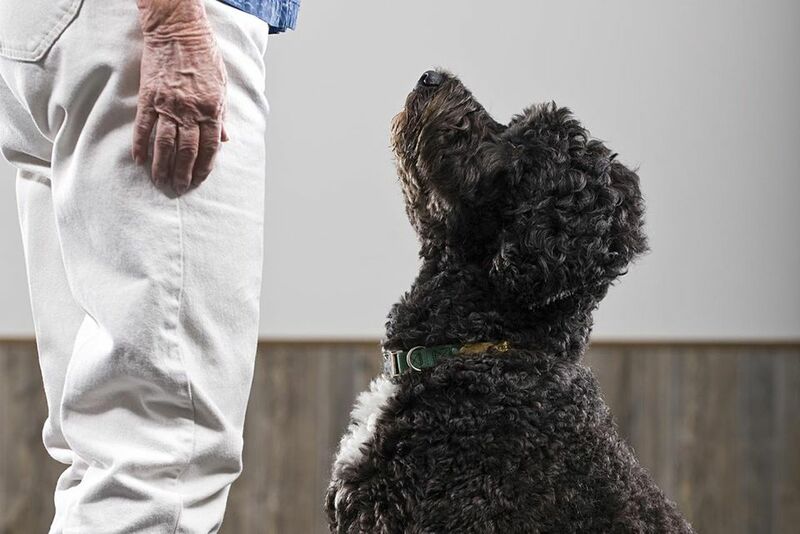 The ability to get your dog's full attention is an important part of dog training. The command "watch me" or "look" is used to get your dog to focus on you. It is useful for times when you need them to pay close attention, such as during obedience training. You can also use it when working on behavior problems or when diverting a dog's attention away from things that bring out fearful or aggressive behaviors. This command is especially helpful for those who work as a team with their dogs as well. For instance, people involved in dog agility or search and rescue can use the command to get their dog’s attention in order to give them instructions on what to do next. No matter what your needs for it are, “watch me” is a very simple command to teach. In order to teach your dog the "watch me" command, you will need some tasty training treats. If you are working on clicker training, you will also need your clicker on hand. Teaching “look” or "watch me" is a great way to introduce your dog to the clicker if you have not already done so. It is best to begin training this command in a spot with very little to distract your dog. Choose a room in the house where you will not be disturbed by family members. You might also want to do this at a time when the house is generally quiet so sounds like footsteps or doors are not distractions. Once you have your clicker and treats ready, say your dog’s name followed by the command “look" or "watch me.” For many dogs, hearing their name will be enough to get their attention. If your dog looks at your face after you give the command, you can praise it or click, then give it a treat. Some dogs may not respond immediately to hearing their name paired with the “look” or "watch me" command. In this case, after you give the command, wave a treat in front of your dog’s nose, and then pull the treat up to your face. Your dog will follow the treat and end up looking at your face. Offer praise or a click, and give the dog a treat immediately. Within a few short training sessions, you should have no problem getting your dog to focus its attention on you. Continue practicing and gradually move up to working in more distracting surroundings to proof the behavior. For instance, go to the same secluded room during a busier and nosier time of day when your family is very active. Once your dog responds well to that, move to another room that gets more traffic and noise. Train this command in a variety of situations. Once your dog masters "watch me" in the home environment with no distractions, work your way up to busier environments, like the park or another public place around other dogs and people. If you are having trouble getting your dog to focus on you, make sure you are using valuable treats. Many people like to use small pieces of cooked chicken or hot dogs. As your dog gets better at watching you, make the distractions more difficult. Try working around a playful dog or a favorite person or ask someone to squeeze a toy or make another inviting sound. Gradually increase the distance between you and your dog. Ideally, you will be able to get your dog to look at you from across a room or even a field.